Hong Kong Chief Executive Leung Chun-ying’s attending a secret meeting in southern China’s Guangdong Province has sparked speculation that he has been given marching orders for dealing with the Umbrella Revolution. Leung traveled to Guangdong Province on Oct. 12, but never made it to his scheduled hotel, the LN Baiyun International Convention Center in Guangzhou. Coincidently, on the morning of Oct. 13, the day after Leung went missing, police showed up in large numbers to remove the barricades erected by democracy protesters in the Hong Kong neighborhoods of Mong Kok and Admiralty. While the police claimed that they were just getting back government property, Joshua Wong, leader of the student-activist group Scholarism, strongly disagreed. 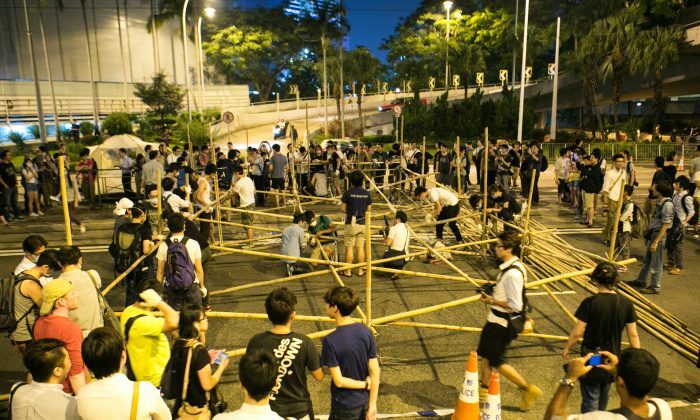 On the afternoon of Oct. 13, unidentified men attacked protest sites in Hong Kong, dismantling barricades that have been used to block roads for more than a week. Apple Daily reported on Oct. 11 that Zhang Dejiang, the high-ranking Communist Party official in charge of Hong Kong affairs, had traveled to Guangdong Province. According to Apple Daily, it was likely that Zhang would be meeting with Leung to discuss the situation in Hong Kong. On Oct. 13, Ming Jing News reported that Chinese authorities were losing patience with the continuation of the Umbrella Revolution in Hong Kong. The paper reported that the special committee overseeing the events related to democracy movement, which is headed by Zhang Dejiang, has issued an ultimatum to the Hong Kong government. Measures that are forceful, but nonviolent and in accordance with the law, should be used to end the movement before Oct. 20, the paper said Zhang ordered. Oct. 20 is the date of the biggest Chinese Communist Party meeting of the year, the 4th Plenary of the Central Committee. “Together, the Chinese regime and the Hong Kong government failed this last time in their effort to use violence to suppress the protesters. It was an order coming from Beijing, while Leung carried out the act,” said Jin Zhong, chief editor of Open Magazine, in an interview with Sound of Hope Radio Network. “The best resolution now is for Leung to step down. But Beijing doesn’t want it to happen now because it would be quite a humiliation to the Chinese authorities,” said Jin.